So, you've discovered that the Pentax 6x7 system is an amazing camera. But, now you're realizing there are multiple ones and that they all cost a different amount of your valuable cash. Believe it or not, there are cheaper versions that are passed off as more expensive, and vice-versa, more expensive ones that get listed for less. So, how can you know what to look for and buy so you get the most bang for your buck? At this point, I'll add that this is in no way meant to be comprehensive. There are plenty of other forums and articles that delve way more in depth to the technical details of each system, as a simple Google search will show. This post was written because, after trying to understand the differences myself, I found that many of the articles that showed up in searches had tons of great technical info, but didn't easily lay out how to easily tell the difference between the various Pentax 67 versions from a buyer's perspective. So, if that's you, read on to find out how to indentify some basic Pentax 67 versions differences! 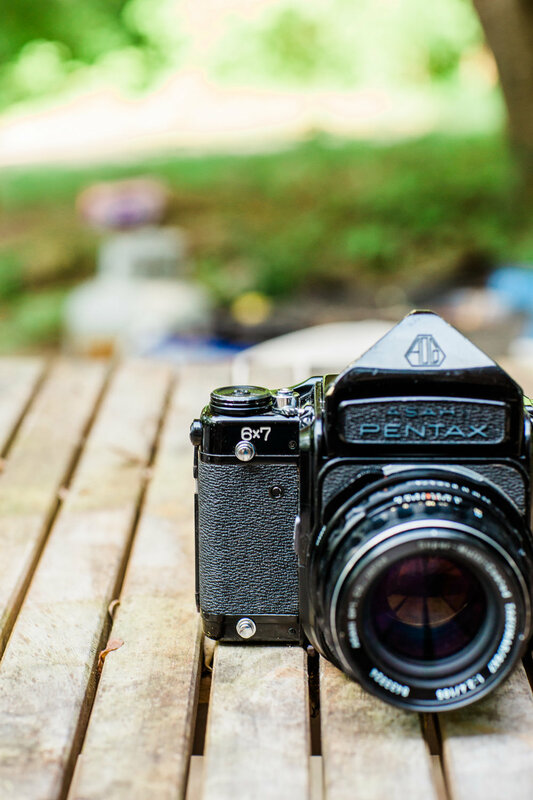 What are the different Pentax 67 Versions? The original Pentax 6x7 was released in 1969, and did not have a mirror lock-up function. These models are the oldest of Pentax's 6x7 models. If for no other reason, these are the least desirable in terms of reliability of the 6x7 models, merely because they are the oldest. So, what is the Honeywell Pentax? Well, included with the earliest version 6x7 is the Honeywell Pentax. It is essentially the same as the Pentax 6x7, only marketed specifically to the USA. 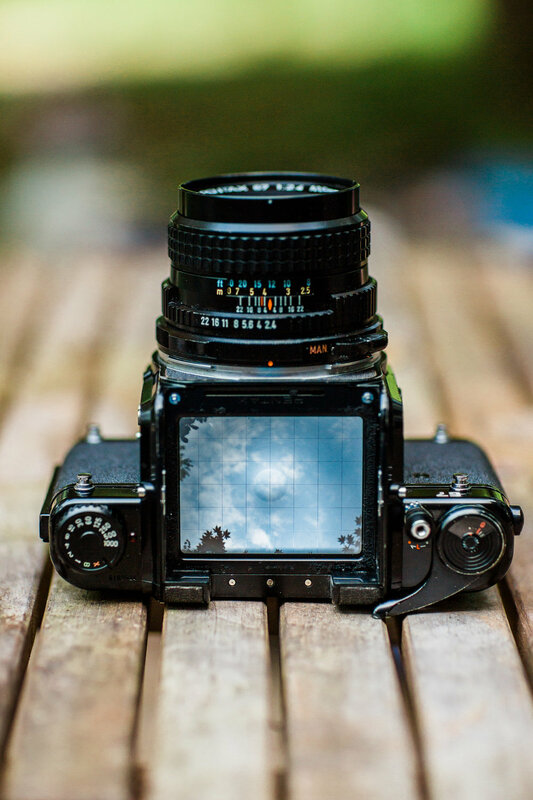 So, how do you tell if a Pentax 6x7 is MLU (Mirror Lock Up), and why does it matter? The MLU version was released as an update to the original 6x7. It has a small switch on the right side near the opening for the lens. These are generally considered more reliable than the non-MLU versions if not for age alone, and typically carry a little bit higher price tag, if the owner is aware. To see whether or not a 6x7 you're checking out has mirror lock-up, check the left side of the front of the camera, near where the lens attaches to the body and you'll find either a button that slides up (indicating MLU) or nothing. That's how to tell if a Pentax 6x7 has mirror lock up. Not too tough to figure out, right? What's the same about the Pentax 6x7 and the Pentax 6x7 MLU? Both of the Pentax 6x7 and the 6x7 MLU featured either a TTL metered or non-TTL prism. These always had the words, "Asahi Pentax" on the front of the prism. The only exception to this rule, or course, is the Honeywell Pentax, which was the earliest version that was marketed to the USA. It is worth noting that various Pentax 6x7s and 6x7 MLUs that you find on Ebay will often have a later version prism on them. 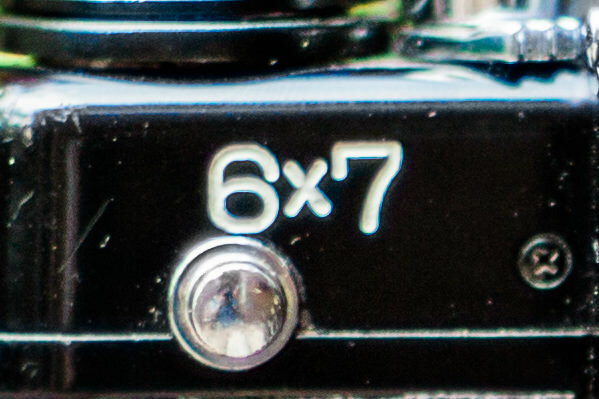 So, going by prism markings alone will not tell you whether or not it is a 6x7, 67, or 67ii. The later Pentax 67 and 67ii sported only "Pentax" on their original prisms, unlike the "Asahi Pentax" on the earlier versions. However, since the prisms are interchangeable between every version and are often swapped out, the best and easiest way to recognize a Pentax 6x7 from the later 67 and 67ii models is to look at the model plate at the top left (when the camera's front is facing towards you). There you will see either 6x7 or 67. 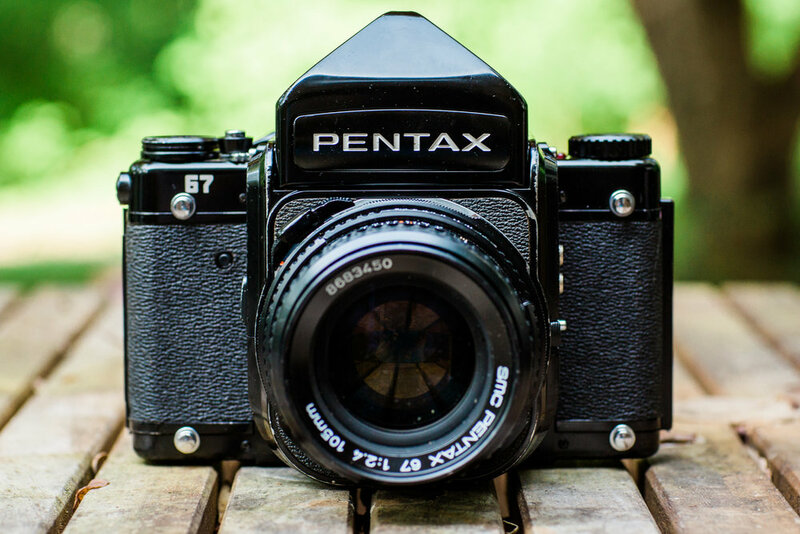 The Pentax 67ii will have a "67ii" inscription on the right front, as opposed to the left. Since they are newer, the 67 and 67ii may be more reliable than an older version. Likewise, the Pentax 6x7 MLU is generally considered a more safe bet than the non-MLU version, if not for any other reason because it is newer. With the 67 came a shutter timing improvement that allowed the exposure value to be more consistent than the 6x7 when using a TTL-Metered Prism. The 67ii featured an updated design which included a better grip on the right side. The 67ii is slightly lighter than the previous versions. The focusing screen of the Pentax 67 versions is not the brightest or best in terms of contrast. However, certain p67 screens are better for specific applications. If you mainly center compose, getting a split prism or microprism screen might be best. If you compose off center, getting a matte screen is your best bet. The microprism screens I've owned on the 6x7's and 67 do not have very good contrast or brightness in comparison to the matte. You can see examples of this in my article comparing the Pentax 67 focusing screens. I have owned a 67ii with a microprism screen that was probably about as bright/contrasty as my 6x7/67 matte screens. I have not tried ALL the screens, but I will say that the brightest and most contrasty screen I have used was the Maxwell Precision Optics Hi-Lux Matte Screen, followed closely by the 67ii screen. The Maxwell screen is very clear, sharp, and bright compared to any screen in any Pentax 67 version I've tried. Are multiple exposures a big deal to you? You'll have to go 67ii unless you want to use a leaf shutter lens and use the multiple exposure function on the lens itself. It's worth noting, if you use a 67 with a leaf shutter lens, you cannot focus/see your recomposed frame. So, the 67ii really shines here with its double exposure ability. I have spoken with two very popular and reputable repairmen, both of which affirmed that the 67ii is a bit more of a risk than the older versions. It isn't built quite as tank-ly as it's previous versions. The 67ii has electronics that, if they go out, pretty much mean the end of the camera for anything besides parts. There are also several other internal differences cause even the mechanics of the 67ii to be a bit more of a monster to deal with, repair-wise. Certain parts used in the 67ii are very hard to come by, which means a possible repair is actually impossible until the parts show up. These are factors that prevent me from putting much stock into using a 67ii as my main 67 bodies. We haven't spoken about the additional wood grip (that can be added to the versions besides the 67ii). However, it can add around $100 to the value of any version. So, if you're looking at 67 version which includes this grip, then you may want to consider that as part of the price. Other items which may affect value include viewfinder type (chimney hood, waist level finder), although none of these greatly affect the price. Very similar 67s with the exact same viewfinders may both go for the same price. Likewise, a 6x7MLU with a wood grip may go for about the same price as one without a wood grip. 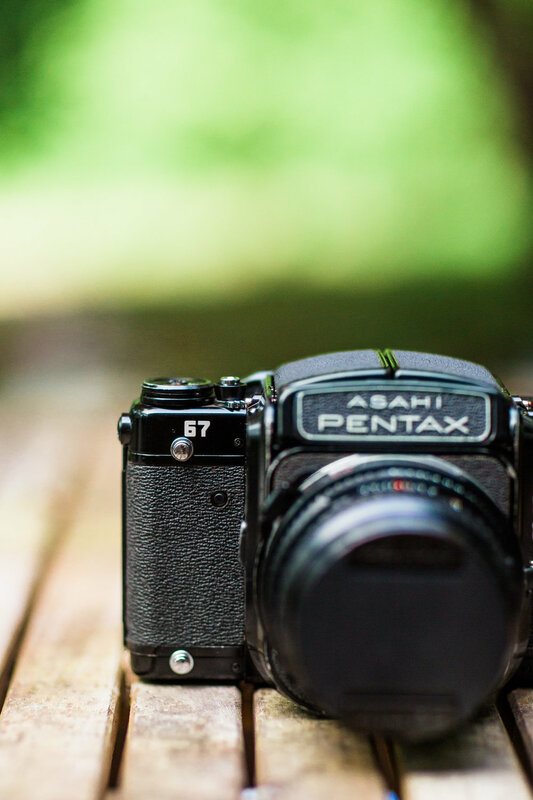 Obviously, the Pentax 67ii has advantages over the earlier versions, but not without a price tag. You can expect to pay possibly $1300 more than what you'd pay for a 6x7 MLU, when you can get the base model in all it's 6x7 glory for probably less than a fifth of the price. The 67 is a good go-between and can typically cost less than double the cost of the original 6x7. However, the Pentax 67ii is definitely "the cream" of this crop. But is it worth all the extra cost and possible hang-ups? For me, I've found that the 6x7 MLU and 67 are great, though I do wish they had a double exposure ability. Unless you just happen to get a dud, whether you get a 6x7 or a later version, you're getting one killer camera. All improvements aside, they're all built tough, so as long as you're getting it from a reliable seller you're making a great choice of camera. If you're considering buying any of the Pentax 6x7 systems off Ebay, please use our links! We get a portion from Ebay when a sale is made using these. Now that you know the differences between the Pentax 67 bodies, why not check out how to tell the difference between the Pentax 67 105mm f/2.4 lens versions, too? If you're interested in finding a good Pentax 6x7 for sale, or a Pentax 67 for sale, we do sell bodies occasionally. We also offer a purchasing/inspection/and tune-up/delivery service, if you'd like us to find one for you and have it delivered. Please feel free to inquire about availability here. Which Body Are You Interested In Purchasing?